Electing Barack Obama president was the first step in redeeming American democracy. The second step must be indicting ex-president George W. Bush, giving him a fair trial, finding him guilty of many criminal acts and putting him in prison. Forget revenge. Think rule of law and justice. I want President Obama soon after taking office to go on television and announce the formation of a special group of outstanding jurists and attorneys to make a recommendation whether or not the US Justice Department should bring criminal charges against George W. Bush. Based on earlier analyses, including work by the American Bar Association, I have no doubt they will recommend indictment. If moral honesty and courage have any meaning, then the nation must take seriously the concept that no president can ever be allowed to be above the law. How can President Obama not strongly support this? Surely no president must be allowed to disrespect and dishonor the US Constitution. George W. Bush broke his oath of office. His behavior was treasonous. Instead of defending the Constitution he disgraced it. Instead of protecting constitutional rights, including privacy, he sullied them. He asserted his right to ignore or not enforce laws so he could break them. Respect for the office of the presidency must never be allowed to trump truth and justice. 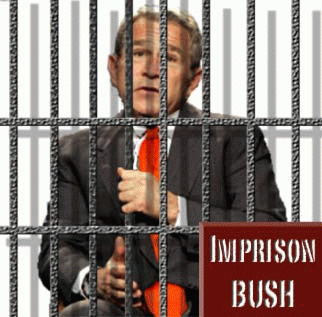 To ensure that no future president behaves like George W. Bush we must punish him. Not merely through the words of historians, but through the physical punishment that he has inflicted on so many millions of people. In previous eras citizens would have demanded “off with his head.” Now we must demand “lock him up.” How poetic for a pro-torture ex-president. As summed up at www.imprisonbush.com: “Bush must be made accountable to the law, to serve as a lesson to all those who would attempt to destroy the American system of laws and liberty for the sake of their own power.” This is a test for both President Obama and American democracy. If there is any kind of God in the universe, then George W. Bush must go to prison. When he does, then and only then should God bless America.